The 20th century bore witness to the creation of the avant-garde movements. Even when these developed mainly in plastic arts, some of them had an influence in architecture, as is the case of De Stijl or Neoplasticism and the Russian Constructivism. Both movements were contemporary of the other big artistic movement of the time, the Bauhaus. The universalizing tendency of the De Stijl soon gave way to the broader, more objective concerns of the Modern movement. 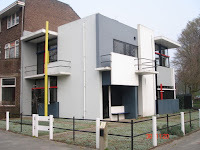 For example, while Rietveld’s famous Schroder House of 1924 in Utrecht -- with movable walls and partitions assuring a dynamic, as opposed to static, sense of space -- exemplified the Neo-Plastic ideal of objects floating in space, he began to embrace a more technical architectural position. The project of De Stijl became, through necessity and evolution, a broader trajectory dedicated to social concerns and conditions. The desire to create architecture for the people through means of production, rather than an architecture simply guided by aesthetic concerns, became a rallying cry of a broader European Modernism. Russian Constructivism was a movement that was active from 1913 to the 1940s. It was a movement created by the Russian avant-garde, but quickly spread to the rest of the continent. Constructivist art is committed to complete abstraction with a devotion to modernity, where themes are often geometric, experimental and rarely emotional. Objective forms carrying universal meaning were far more suitable to the movement than subjective or individualistic forms. Constructivist themes are also quite minimal, where the artwork is broken down to its most basic elements. New media was often used in the creation of works, which helped to create a style of art that was orderly. An art of order was desirable at the time because it was just after WWI that the movement arose, which suggested a need for understanding, unity and peace. Famous artists of the Constructivist movement include Vladimir Tatlin, Kasimir Malevich, Alexandra Exter, Robert Adams, and El Lissitzky. Tatlin's most famous piece remains his "Monument to the Third International" (1919-20, Moscow), a 22-ft-high (6.7-m) iron frame on which rested a revolving cylinder, cube, and cone, all made of glass which was originally designed for massive scale. After the 1917 Revolution, Tatlin (considered the father of Russian Constructivism) worked for the new Soviet Education Commissariate which used artists and art to educate the public. During this period, he developed an officially authorized art form which utilized 'real materials in real space'. His project for a Monument of the Third International marked his first foray into architecture and became a symbol for Russian avant-garde architecture and International Modernism.